have many protective gloves to choose from. The MX-10RP Nexstar I with "POLICE" ID Gloves from Damascus are a tough, dependable glove built to handle the dangers that law enforcement officers regularly face in the field. The close fitting gloves are constructed from a lightweight Spandura® textile that offers maximum protection without restricting the ability to reach into pockets or other tight spaces. Reflective "POLICE" identification plates leave no doubt as to the wearer's authority or reason for being on the scene. A breathable design allows for cooling air ventilation to offer comfortable use year-round. The palms feature a Clarino® synthetic suede with reinforced seams and fingers to deliver improved gripping strength that will not deteriorate with daily use. Adjustable wrist closures provide a secure fit that keeps debris and other irritants out for all-day comfort. 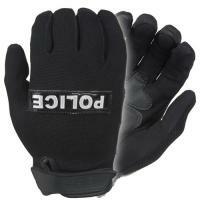 The gloves are machine-washable for effortless maintenance and care. Extra Small (XS) - 7"
Extra Large (XL) - 11"
Double Extra Large (XXL) - 12"
Triple Extra Large (XXXL) - 13"
I lose gloves religiously so for the price these are great. Good quality and just in case they didn't know who you are the ID can remind them lol.